How would you answer the question, What children's book changed the way you see the world? Is it a book from childhood...a book you read to your children...or a book you read to a class as teacher? Was it a gift or a favorite from the library? Why was this book important to you and what did it teach you? Anita Silvey, a lover of stories and the stories behind the stories, set out to document the experience numerous leaders in our society had with their important children's books. Collectively the narratives were published in a beautiful, oversized book, Everything I Need to Know I Learned from a Children's Book. A passage from each of the selected influential books is paired with over 100 personal stories from celebrities, writers and other notables. This book is visually appealing and packed with emotion. I thought it would be interesting to find out my own personal version of Anita Silvey's book. 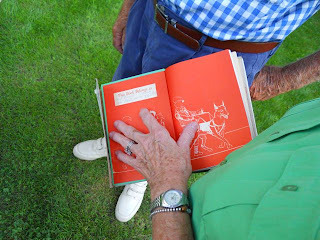 I asked my grandmother if she could remember a children's book that was important to her or made an impact on her life. She is an avid reader and devours more books than anyone in our family. She responded, "I used to get the Bobbsey Twin books at birthdays and holidays. I used to keep them on the porch, but I just put them up." I asked, "Are the books easy to get to?" She told me she knew right where they were and would find them right away. In the meantime, I told my daughter that Grandma was going to find books that she read when she was younger. We eagerly awaited Grandma to return with her special books -- The Bobbsey Twins at School and The Bobbsey Twins in the Country. 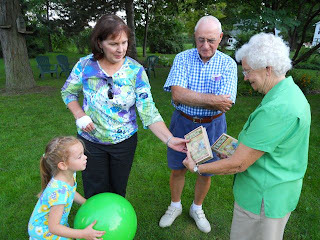 My daughter was so excited to see books that her great-grandmother enjoyed when she was younger. According to the inscription, my grandmother received this book for her 8th birthday. The other book was a gift for Christmas in 1934. I asked my grandfather the same question. He responded, "I don't remember any children's books. I lived in a fog. I didn't know the difference between girls and boys until I was in the 6th grade." This response is exactly what I should have expected from my grandfather. After the laughter subsided, he said, "Not that I was a great parent, but I did read to your mom and aunt. We used to read Bible stories before bed." Grandma invited me upstairs to the spare bedroom of their farmhouse, where stacks of books were growing right out of the floor. She located a bag of books that looked as if they were ready to be given away to first person interested in them. 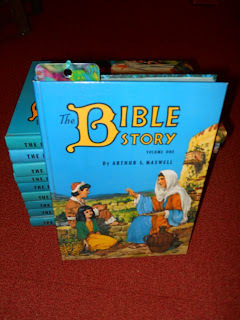 Inside the bag were ten volumes of The Bible Story by Arthur S. Maxwell. Over the past week, my daughter has read The Bobbsey Twins at School on her way to school each day (the bookmark shows she has finished 3 chapters already!). I have read Bible stories to my children before bed each night just like my grandfather did fifty years ago. It is amazing what a simple question at a family gathering conjured up. Anita Silvey has spent over 40 years in the children's book industry. Many years were spent as a book publisher and editor of The Horn Book Magazine. She has also spent time as an author of books such as 100 Best Books for Children and 500 Great Books for Teens. I believe it is fair to say that most of her time currently is spent writing and managing her website Children's Book-A-Day Almanac. This website features a children's book each day that is carefully selected and connected to the calendar day. According to an interview with Hunger Mountain, Anita Silvey explained, "Since I've read over 100,000 children's books, my brain data base actually comes in handy for a project like this one." I subscribed to her website through Facebook and Twitter and I highly recommend it. I was nervously excited to meet Anita at the Mazza Museum Conference last July. I referred to my notes from her keynote speech for this book post hoping to find the perfect quote. However, I had very few notes because I was hanging on each word and story she told with no time to write. In my notebook, I did scribble down the words, "Right book, right child, right time." These words with the quote from the jacketflap of Everything I Need to Know sums things up very well, "When we give children books we become part of their future, part of their most cherished memories, and part of their entire life. Children's book change lives." "Happy" always gets attached to birthday wishes, and it is the one emotion that I don't associate with mine. In my early years I have no memory of my parents celebrating my birthday. As it fell in early September before the beginning of school, the classroom parties that I enjoyed for other students didn't happen until school was in session. When I was eleven, my youngest sister was born with cancer. She's alive today and only had to face two operations. But, as so often happens in a family where one child faces extreme illness, her disease dictated the family dynamics. I love Cynthia Lord's Rules, in part, because she accurately captures what occurs in a family, even a well-meaning family, when one child demands medical attention. For me, my sister's cancer meant growing up too quickly -- and taking over the care of my other sister Lisa, just a baby herself. The birthday I remember the most clearly, my 14th or 15th, came about because of the kindness of my friends. They threw a completely unexpected surprise party -- which also served as a back to school get together for our crowd. I still cry when I think about this event today. Our literature about adolescence is often filled with details about the cruelty, the clicks, and the meanness of young girls and boys to each other. But all too often these writers downplay the amazing kindness that friends can show each other. My friends had a party for me because they knew, at some level, that no one else would make much of my birthday. And so they did. I've reconnected with some of those elementary, junior high, and high school friends through Facebook. So if any of them read this today, I just want to say "thank you" after all these years. One of the many reasons why I love social media is that people often send good wishes on birthdays. For me it helps drive the birthday blues away. I don't approach birthdays expecting to be happy -- but I do want to be at peace. I want to have spent my year well and in service to others and to my profession. This birthday I will celebrate writing a year of The Children's Book-A-Day Almanac, an on-line resource for those who want information about great books. Thanks, Eric, for thinking of me on my birthday. Thank you Anita for sharing your birthday thoughts. Your stories and insight catch my eye each day. Thank you for everything you do! Great post, Eric. I'm one of Silvey's big fans, too, and have quoted her on my page on the importance of reading aloud. Thanks for recognizing her many accomplishments -- and her birthday, of course! Lovely post! I don't know Anita (though I follow her on Twitter, as does everyone.) This post makes me feel as if I do!